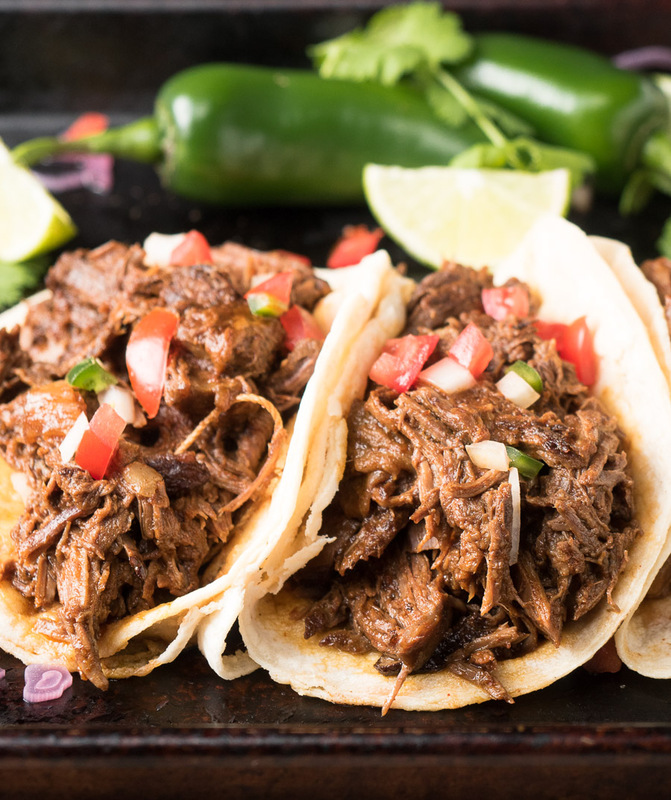 Beef barbacoa is a sure fire way to make tacos that people talk about. Talk about in a good way. Rave even. Big beefy taste. Gentle heat from the chiles. And a little tang at the end. Just big, wonderful flavours. Hard to beat. And it’s not hard to make. 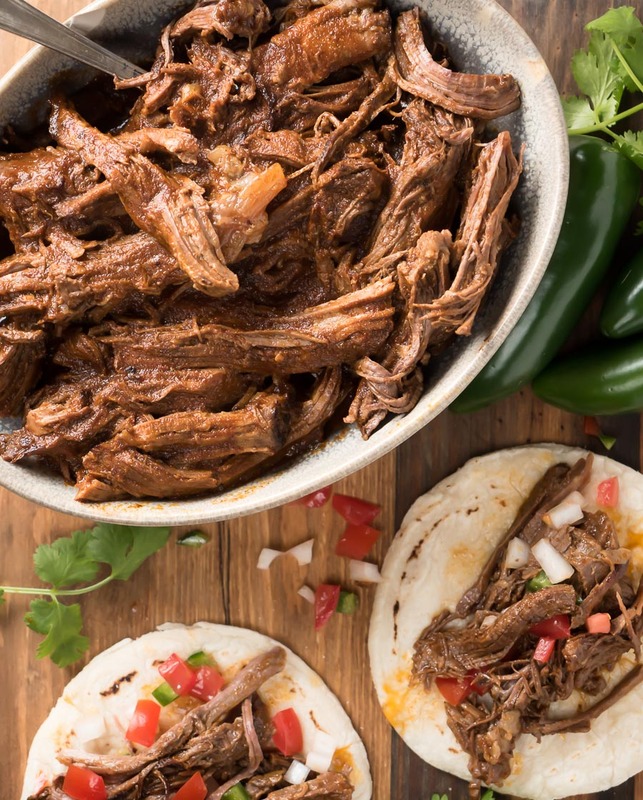 If you can make pot roast, you can make beef barbacoa. Better than taqueria beef barbacoa is a bit of a tall claim. I know. But keep in mind they made their barbacoa yesterday. This morning maybe. Reheated to order. You can serve it that way too. Then it’s just “as good as taqueria beef barbacoa”. But when it comes out of the pot and onto a soft tortilla. That’s taco heaven. At least I didn’t say better than Chipotle’s barbacoa. Not sure how a company that cooks at a central factory and ships country wide is the gold standard. But it seems it is. Just look around the internet. Everyone is making barbacoa as good as Chipotles. Call me crazy but there’s better out there. Don’t get me wrong. As far as mass produced fast food goes, Chipotle’s barbacoa is pretty good. For mass produced fast food. But I’m not going to compare what I cook to them. And nor should you. Dare to want better. The secret is in the braising liquid. Great barbacoa starts with mix of chili powder and chipotle in adobo. Some Mexican spices. A bit of vinegar for tang. Garlic. Simple ingredients. But when they come together with the beef. Wow. The beef cooks slowly in this mixture until it’s fork tender. This is slow food. Think brisket. Tough meat made meltingly tender. I love doing that. Taking tough, nasty meat and making something great. The real magic comes from the wonderful juices from the beef. Into the sauce. What you wind up with is this incredibly savoury liquid. That liquid goes into the shredded beef. Every bite coated with that wonderful sauce. Slow cookers take this too far. You get great sauce. Sure. But the meat is always tasteless. All the flavour out of the meat and into the sauce. I don’t do the slow cooker thing. Never will. I’m after balance. I want the best. No compromise for convenience. Sorry. Serve your barbacoa with Yucatan pickled onions and pico or salsa verde. Or try topping the tacos with quick Mexican slaw. That works really well. If you’re watching your carbs use it in a lettuce wrap. Kind of Mexico meets Korean bulgogi. No reason you should deprive yourself. Or try it on nachos. Crazy, crazy good nachos. Like – “I started a food truck on the strength of these nachos”. Any way you serve it you can be certain that this will be about the best beef barbacoa you ever eat. 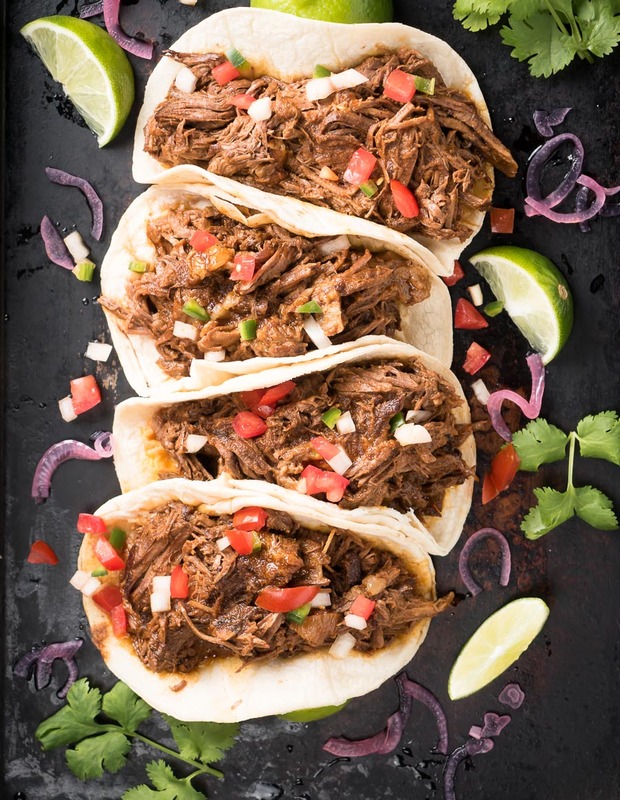 You can make beef barbacoa that's better than you can buy. It's meltingly tender and loaded with beef flavour. 1-3 chipotles in adobo plus some of the adobo puree - depending on how spicy you like it. Pre-heat your oven to 275F. Combine the cider vinegar, garlic, Mexican oregano, cumin, chili powder, chipotles and adobo, salt and enough water to make a smooth paste in a blender. Blend until smooth. Brown the beef in the oil using an oven proof dutch oven large enough to hold the beef. You want the meat to brown up but not crazy brown. If you push it too far the edge of the beef will not get to the meltingly tender stage. This step is critical to getting the big beefy flavour so don't skip it. Adjust your heat to medium low. Pour the chili/vinegar paste into the pan. It will bump so be ready. Don't wear nice clothes for this step. Cook the chili/vinegar paste for about 2 minutes, scraping up any browned bits on the bottom of the pot. Add the chicken stock and return the beef to the pot. Cover and place in the oven. Cook (braise) the beef for about 4 hours. You are going for fork tender. Start checking around the 3 hour mark. It's like BBQ brisket. It's ready when it's ready. Not before so don't pull it because you are running out of time. If it's taking too long nudge the temperature up to 325F and check every 15-20 minutes. Remove the beef from the pot. Let the beef cool until you can shred it. Two forks works for this. Your hands work pretty well too. Pour the liquid into a bowl. Skim the fat from the surface. If you have a fat separator kicking around from Thanksgiving use that. Pour the defatted braising liquid (sauce) into the shredded beef and mix. Return the meat and liquid to the pot. Bring to a simmer and cook for around 5 minutes. This gets the sauce and the meat to really come together. Taste and adjust salt if required. 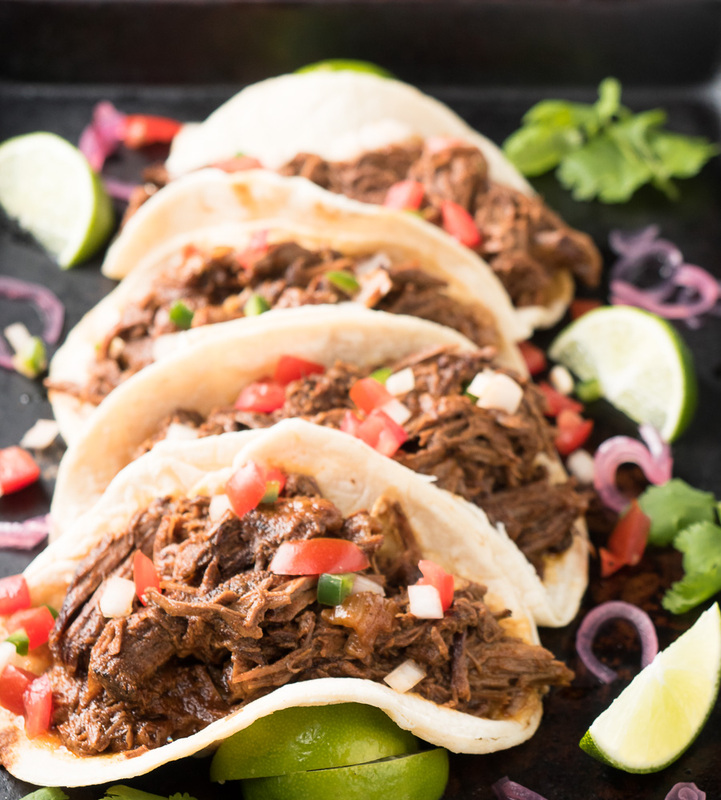 Serve and prepare to be told you make better than taqueria beef barbacoa! 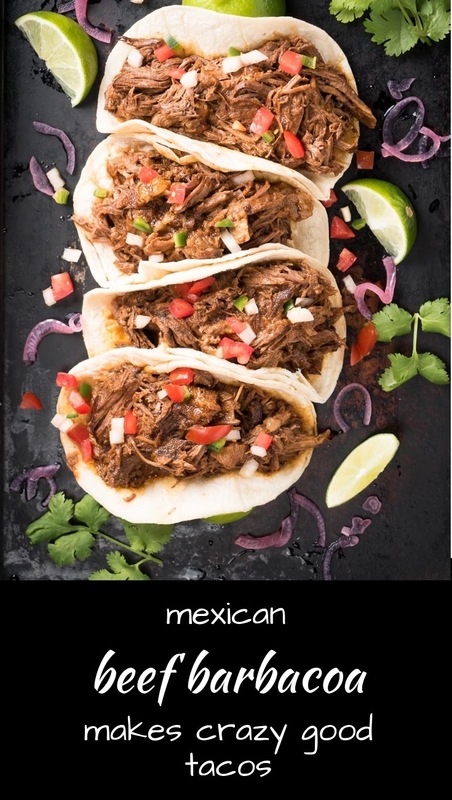 Beef barbacoa goes great with pico de Gallo or salsa verde along with Yucatan pickled onions. If you have to reheat there are a few options. Microwaving is probably at the bottom of the list. Gently warming in a saucepan works. Best of all is to vac pac it using a food saver and warm it in hot water. In main course, meat, mexican. Bookmark the permalink. Absolutely delicious, will definitely be making this again. Glad you liked this. It’s a great way to feed a crowd something special. 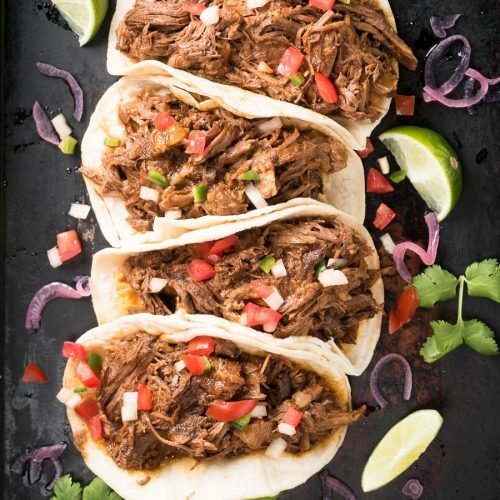 Great recipe- even though I didn’t have the Mexican oregano (and I listened to your warning about no substitute) or the chipotles in adobo the beef was perfect for tacos and everyone enjoyed it. We had varying levels of hotness-tolerance eaters so it worked out perfectly….folks could add hot sauce accordingly to their little piece of taco joy. Yup- another keeper for my magical recipe folder! So glad you liked it. I’m a chilihead so I like the taste of the chipotle cooked in but when you have a crowd of people and you don’t know who will like what letting them spice to their taste is a great idea.